Matthew 7:7 "Keep on asking and it will be given you; keep on seeking and you will find; c]">[c]keep on knocking [reverently] and [the door] will be opened to you." "Whoever is simple (easily led astray and wavering), let him turn in here! If any of you is deficient in wisdom, let him ask of the giving God [Who gives] to everyone liberally and ungrudgingly, without reproaching or faultfinding, and it will be given him. The Lord watches over us and He sends us who and what we need--Don't Miss It! He sends His Truth-Bearers to pour out the Wealth that cannot be measured. The benefits are Always far greater than the momentary confrontations, humiliation and the correction that the Lord sends through His Truth-Bearers. The Spiritual value of knowing that the Lord sent someone to watch out for us Is Priceless. Appreciate The Lord by Appreciating them, for they Serve the Lord by Serving His people. They obediently speak the Truth sent to rebuke, remove, and kill off the seeds of destruction planted within us, to get rid of them whether these seeds have just been planted or have taken root within our hearts. They are sent to help us achieve the future that God has planned for each of us. God increases our unique and eternal Value when He sends His Truth-Bearers to us. Is a wise rebuker to an obedient ear." To the people who have an obedient ear the Lord sends a Wise Rebuker. And, there are some people that are Spiritually immature, and when the Love of God sends them an obedient Truth-Bearer to help them--they listen, they even act interested and feign joy at being told a Word from the Lord. But do not obey, in fact they do the exact opposite from the Instruction given them. The book of Proverbs belongs to the Purpose And Power of Wisdom. She Is a Good Sister, a Good Friend to have in your daily life. Talk to Her, spend time with Her, ask Her what She thinks about Everything concerning your life. Ask for Her directions and Instructions, they will guide your heart and your feet every moment of every day. She is sent and will Stand in the middle of things, always calling our to those who have an obedient ear attuned to hear Her---these people follow the instructions and directions of God, Who Is Wisdom. God sends the Truth-Bearers to affirm right choices, and to help you when you have made bad decisions and are now stuck in the middle of what you cannot get out of by yourself. They are sent to correct crooked paths, to restore His Divine Order. When we ask God what should we do about anything and everything, God is going to send Wisdom to help you. And Wisdom will guide you and correct your thinking--separating what you Think you should do, And what God has directed you-given you instructed you to do. This is where many people arrogantly make mistakes by ignoring what Wisdom has said to do and doing what they 'feel' and 'think' is best for them to do. The Spirit of the Lord pours out Sister Wisdom to help us face each difficulty by the Power of His Truth and by His Way planned. 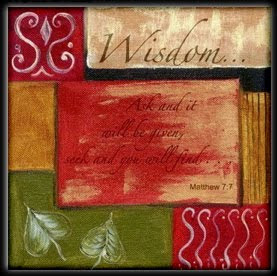 Wisdom when actively listened to, and heard with an obedient ear will bring forth the Delivered Promises of the Lord. This also increases our strength, our confidence, and our love. Deeper and more closely are we Spirit led than fleshy, emotionally led. Our Spiritual maturity grows when the Wisdom of the Lord is completely obeyed by Faith! There is a perfect match that has been Divinely created; inasmuch, that the Truth-Bearer is sent to and seeks an obedient ear to speak to. To be poured out into. An ear that is determined to hear and obey. Without any limits, without any delays God sends to us our Sister Wisdom so that Her wealth is heard, received and acted upon through simplicity and humility. Now that's enough to make some of you jump up with Praise! The Wisdom of rebuke is Also included in God's Wisdom! She don't play! Discerned by hearing hearts, determined to obey their Lord. The Truth-Bearers and the Obedient ears are possessors of a Wealth that Cannot be measured by human or earthly standards. When you know better you Can Do Better. The questions for us Is; Now that you know better, why are you Not doing better?